I rarely pass this type of message along … but this is powerful; worthy of consideration! For those of you that have seen it before … it’s worth reviewing as we face the elections. 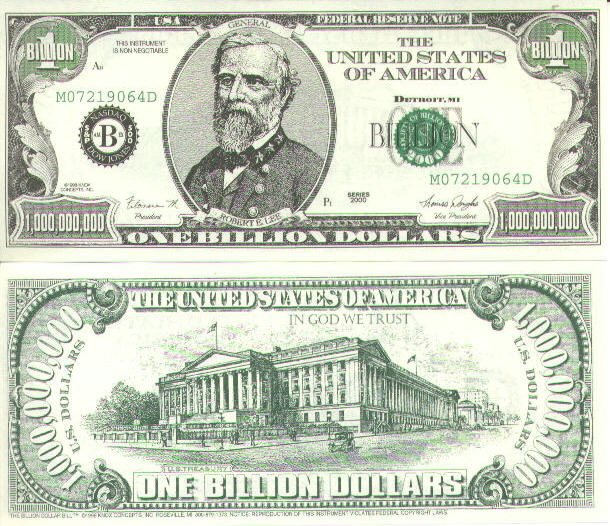 // R.
Subject: What is a billion? A. A billion seconds ago it was 1959. B. A billion minutes ago Jesus was alive. D. A billion days ago no-one walked on the earth on two feet. E. A billion dollars ago was only 8 hours and 20 minutes, at the rate our government is spending it. Louisiana Senator, Mary Landrieu (D), is presently asking the Congress for $250 BILLION to rebuild New Orleans . Interesting number, what does it mean? A. Well, if you are one of 484,674 residents of New Orleans (every man, woman, child), you each gets $516,528. B. Or, if you have one of the 188,251 homes in New Orleans, your home gets $1,329,787. Washington, D.C. HELLO! … Are all your calculators broken? Tax his bed in which he lays. Teach him taxes are the rule. Tax him if he tries to think. That after taxes, he has no dough. Tax him until he’s good and sore. Tax the sod in which he lays. We’ll still be after the inheritance TAX!! and our nation was the most prosperous in the world. We had absolutely no national debt, had the largest middle class in the world, and Mom stayed home to raise the kids.